Do you believe that evil exists? 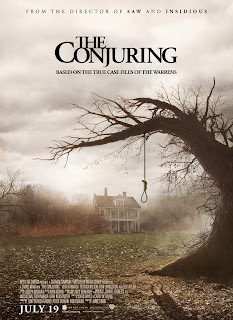 “The Conjuring” is based on a true story about one family who can answer that question with a loud “YES!” After seeing “The Conjuring,” we are not sure how we would answer the question, but this scary movie kept us up all night thinking about it!. A great horror movie needs great actors to interpret it. “The Conjuring” stars Lili Taylor and Ron Livingston as the Perrons, and their superb acting (as well as that of Vera Farmiga and Patrick Wilson, who play the Warrens) makes the whole movie terrifyingly believable. Moreover, the sets in the movie are very old-fashioned and gloomy, and the photographer used dark, documentary-type style to make the film even gloomier. The acting matched the sets perfectly, and this made the whole film terribly frightening. At the end of the movie,Ed Warren says, “The devil exists. God exists. And for us, as people, our very destiny hinges on which we decide to follow.” This means that whatever we decide to do, we should follow our hearts and not allow our convictions to shake. “The Conjuring” is not only an entertaining movie but also an Inspirational movie. After watching it, you will think of horror movies differently. If you want to challenge your beliefs about evil, don’t miss the film “The Conjuring;” it will break your traditional concept of horror movies.